MELBOURNE men are mad for mirdles - man girdles - with Victoria selling more than any other state. The new compression garment can squeeze up to 3cm off a man's waist and has been a hit among men seeking their slimmer selves without visiting the gym. 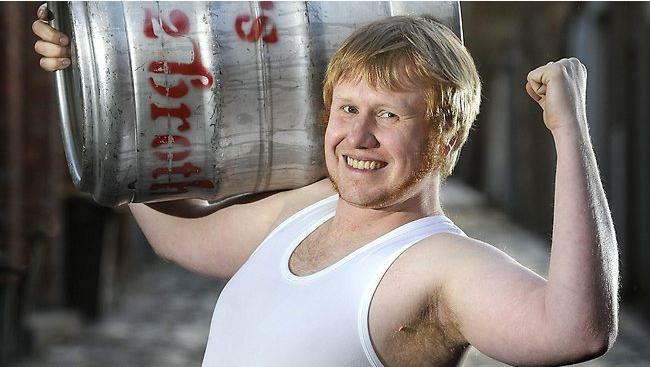 Pub manager Toby Kingsley, 29, took the mirdle for a spin and said he felt like a new man. "It feels quite comfortable and I am looking rather buff," Mr Kingsley said. "I don't know if my wife would like it. It's a bit like the bro (man bra), it makes me think of Seinfeld." Australia has become the second-biggest consumer of compression garments for men, behind the US, and major retailers have begun to stock several lines of the slimming undergarments. Mirdle makers Sydney company Equmen CEO Anthony Pavlakis said the shirt was originally made for athletes, but the slimming properties propelled the top to stardom. "The slimming effects were in fact a beneficial byproduct of the garments function," Mr Pavlakis said. "Most men would not think to wear something of this nature, but once a guy puts it on, the instant effect of how they look and feel makes them want to wear it every day." Sales were about 4 per cent higher in Victoria than NSW. Bang Prahran store manager Scott Kimball said Melbourne men loved the new shirts.